Joaquin Phoenix plays Jesus in a new film. Here's the one thing he refused to do. 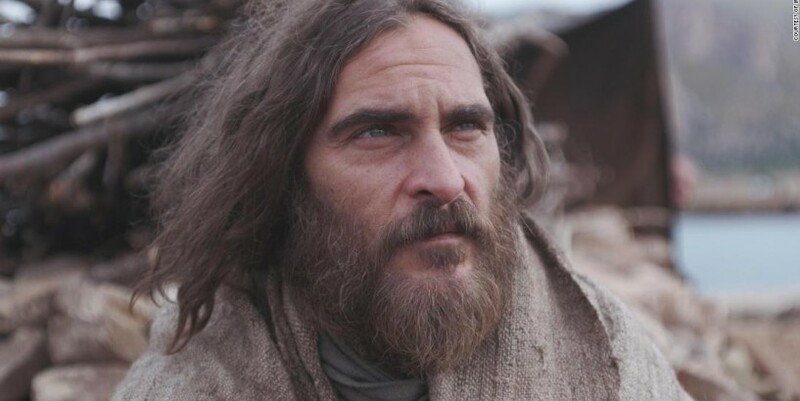 (CNN) When Joaquin Phoenix took on the role of Jesus in the new film "Mary Magdalene," he did many of the expected things: Grew long hair, adopted an intense and otherworldly stare, even meditated on a mountaintop. But there was one thing he would not do. Near the beginning of "Mary Magdalene," which opened Friday in the United States, the script called for Jesus to heal a blind woman by rubbing mud in her eyes, an echo of John's Gospel . (It's a blind man in the Bible, a blind woman in the film.) "I knew about that scene from the Bible, but I guess I had never really considered it," Phoenix told CNN in a recent interview. "When I got there, I thought: I'm not going to rub dirt in her eyes. Who the f*!# would do that? It doesn't make any sense. That is a horrible introduction to seeing." Read More The Bible doesn't fully explain why Jesus used mud or clay to heal the blind, though some experts say it was a common practice among first-century healers. In "Mary Magdalene," Phoenix decided to go with his gut, licking a mudless thumb and gently rubbing the woman's eyes. "It freed me up, in some ways, to discover what is truthful in the moment," he said. "That moment is not so much about a real miracle. It's about someone who has been dismissed by society finally being seen, embraced and encouraged to join the broader community. To me, that is a miracle. There's something profoundly beautiful about that sentiment." That humanistic message captures the essence of "Mary Magdalene," a film that aims for historic fidelity in some respects, but whose emotional and intellectual currents are radically contemporary. Rooney Mara plays the film's title role as a spiritual seeker and kindred soul to Jesus. A spiritual but not religious film The filmmakers' aim was to "rescue" the title character, telling Jesus' story from a feminine (and feminist) point of view. Embodied by a lithe and luminous Rooney Mara, Mary Magdalene is portrayed as a spiritual seeker and kindred soul to Jesus. Their bond perplexes and irks the other apostles, particularly Peter, who seeks to marginalize Mary. In that and other respects, "Mary Magdalene" seems to draw inspiration from both the #MeToo movement and the "Gospel of Mary," an apocryphal book discovered in 1896. Somewhat ironically, the film's US distribution was delayed for several years after the Weinstein Co. folded during the real life #MeToo scandal. The director, Garth Davis, who drew acclaim for his first feature film, "Lion," said he felt "disconnected" from church while growing up in Australia. Like a growing number of Westerners, his spiritual life lay outside of organized religion, another theme prevalent in "Mary Magdalene." "I didn't want to make a religious film," Davis told CNN in an interview. "I wanted to make a spiritual film." In one pivotal scene, Mary strongly suggests that the apostles have clouded Jesus' message with their own. The coming kingdom that Jesus preached is not something we can see with our eyes, she tells Peter. It is the contentment of a soul that has renounced resentment and anger, that grows with every act of love and care. "It's not a place that you can get there and stay forever," Mara told CNN in an interview. "It's a choice you have to make every day, every moment." In the film, Peter tells Mary that she's wrong, accusing her of weakening their movement and Jesus himself. Nevertheless, she persists. "I will not be silent," Mary says. "I will be heard." Chiwetel Ejiofor as the Apostle Peter and Mara as Mary Magdalene. Whether "Mary Magdalene" accurately portrays its title character is a question for scholars. But its presentation of a woman challenging the patriarchal structure of organized religion is firmly of this moment. Even before the #MeToo explosion, women in conservative Christian circles have been pushing back against strictures that have often sidelined and silenced them. For centuries, Mary Magdalene herself was buried beneath false conflations with other biblical characters and called a demon-possessed whore. Not until 1969 did the Catholic Church's cease to identify her with the "sinful woman" who anoints Jesus' feet in Scripture. The church later gave Mary Magdalene her due, calling her the Apostle of the Apostles because she was the first to witness the resurrected Jesus. Mara, who was raised Catholic and attended Catholic schools, said she was initially reluctant to take the title role. "I had all these preconceived ideas about Mary Magdalene and about religion in general, a lot of baggage that made me hesitate," Mara said. "It wasn't until speaking to Garth and looking at the story as an adult, without that baggage from Catholic school, that I could strip it back and see it with fresh eyes." Even in the modern age, the urge to sexualize Mary Magdalene apparently runs strong, with popular books and movies proposing that the bond between Jesus was more than spiritual. In "Mary Magdalene," their kinship is deeply emotional but not sexual. Mary alone sees the toll that Jesus' life has taken on his mind and body. "The heart of the relationship is an understanding that they both see themselves in each other," Mara said. "Mary has felt out of place her entire life, and they really understand each other in a way no one else can. There is a deep love there." What will Christians see in 'Mary Magdalene'? Films about Jesus and the early Christians often have to pass through a narrow gate. If they are too pious, they risk turning away secular viewers. If they take risks and go "off-Scripture," they could alienate religious believers. That's true of "Mary Magdalene" as well, said Kutter Callaway, an assistant professor of theology and culture at Fuller Theological Seminary, an evangelical school in California. "Many conservatives will get angry immediately if they even pretend to have a piece of art that puts words directly in Jesus' mouth that are not from Scripture." Nonetheless, Callaway, who has seen the film, said it "feminizes" Jesus in a "good way." By de-centering the Jesus story and focusing on women, the film shows just how radical it was for a woman such as Mary Magdalene to give up her home and family to follow Jesus. "It forces the viewer to be driven and oriented by gritty, on-the-ground female concerns," Callaway said. "There's a pervasive threat of violence that even now is always in play. It's a very different message from most films about Jesus, but it is also really important for today, when we are having conversations in the religious community and more broadly about how women are treated." In one terrifying scene, Mary's family performs an exorcism on her, thinking that her extraordinary behavior is the result of demonic possession. But already some conservative Christians have criticized "Mary Magdalene," calling its message "heresy" and saying that it cannot be accurate since it relies on texts that are not in the Bible. Phoenix's portrayal of Jesus, too, is far from the "shiny, happy, super-powered" Christ of many Jesus films, Callaway said. "Mary Magdalene" captures Jesus in his later years, when he is wearied by his past and worried about his future. As portrayed by Phoenix, he is often disheveled and remote, more the prophetic Man of Sorrows than the exalted King of Kings. His slow burn in the temple as he watches the money lenders sell animal sacrifices, a prefiguring of his own sacrificial crucifixion, captures the film's ambivalence about Jesus' mission. "Mary Magdalene" captures Jesus in his later years, with Phoenix often disheveled and remote. Phoenix said he sought to portray the humanity of Jesus while recognizing his divinity as well. "What the film is saying is that all of us contain both of those things simultaneously. That's my personal belief." How does an actor convey that belief on screen? "The key for me was not to apply any rules to the character," he told CNN. "There are times when he is filled with rage and times when he is at peace. He is very much a human being. The one thing we keyed in on was that everything he felt, he felt strongly. I don't know if it was a sixth sense or something else, but he made an effort to listen to others and be deeply empathetic." After he arrived on set in southern Italy, Phoenix said, his mind was swimming in research and thoughts about Jesus. He decided to go up to the mountains, alone. What did he do up there? "A bunch of stupid sh** that I'm not going to tell you," the actor said with a laugh. "It was a meditative moment where there is nothing to do and you just stop. Your mind stops. And that is the key."